The Soldiers Memorial Avenue commemorates those who served in World War One. A sign marks the avenue and has an honour roll listing 40 names of those who served. The deterioration of the avenue prompted a small group of local residents, Trish Rock, John Walters, Greg Bok, Christina Holmdahl and Greg Husband to form a committee to raise the funds necessary to address this neglect and revitalise the avenue. The committee’s aim was to create a fitting respectful memorial and an attractive entrance to Clarence Point. 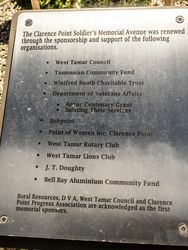 Funding was received in May 2016 through the ANZAC Centenary Grants Program to refurbish the World War One Honour Board and install a story board at Clarence Point’s Avenue of Honour. The existing trees were replaced with ornamental pear trees. The Soldiers Memorial at Clarence Point was restored by a small group of local residents, whose aim was to create a respectful and fitting memorial for the forty men the local and nearby communities who paid the ultimate price in the name of peace in the Great War. Each soldier is commemorated by a tree that has been planted in his name and sponsored by the following community members. Appreciation to the Clarence Point Community Group of Point of Women Inc. for their assistance and support. 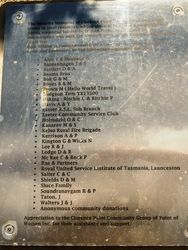 The Clarence Point Soldier`s Memorial Avenue was renewed through the sponsorship and support of the following organisations. 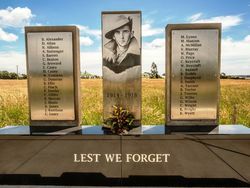 Boral Resources, D V A, West Tamar Council and Clarence Point Progress association are acknowledged as the first memorial sponsors.